The Underground Scholars creates a pathway for formerly incarcerated and system impacted individuals into higher education. We are building a prison-to-school pipeline through recruitment, retention, and advocacy. Our continued success directly challenges the stigmas associated with our population. BUS co-sponsored Restore Our Rights with All of Us or None on January 17 at Booth Auditorium. Our BUS secretary, Aminah Elster, moderated the event which focused on restoring the right to vote to people on parole. Thank’s for signing up for the newsletter! Take a BUS class this spring to help get orientated to campus. The class is skill-building, non-academic, Pass/No Pass and can be taken for 1 or 2 units. It meets Mondays from 2-4pm at Stiles Hall. Are you interested in Social Work and abolishing the Prison Industrial Complex? 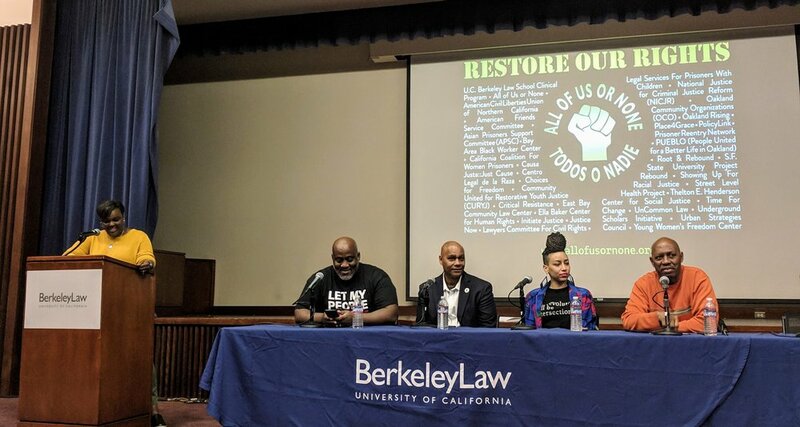 Join the Abolition Social Workers at Berkeley. Send correspondence to abolition@berkeley.edu. The Prison Correspondence Program is looking for volunteers to academic advising, guidance, and support to currently incarcerated folks through letter writing. Apply HERE. USI member speaks out about past conviction: "A past conviction shouldn't be a life sentence to joblessness"